There is nothing more classic then black and white; clean, simple and elegant. The couples day started with a custom altar. Instead of a backdrop or altar stands; a table adorned with candles, roses and draping; lets not forget the silver accents. Black chair covers contrasted the white table clothes, with a black napkin, a custom black glitter place card for each guest. Silver candelabras, mini vases with roses and more candles in votives. You can never have to many candles!!! 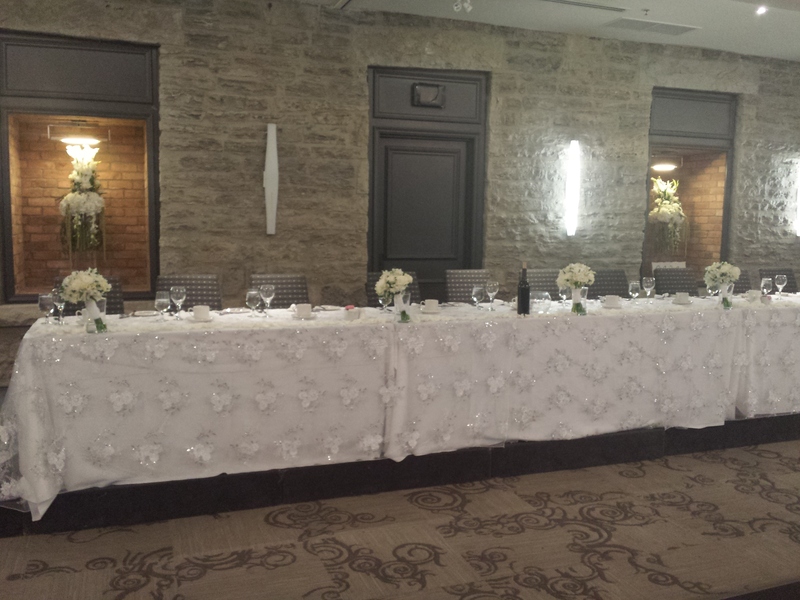 Head Table Draping and a Backdrop completed the focal point of the room and don’t forget the silver accents for that little extra finishing touch. 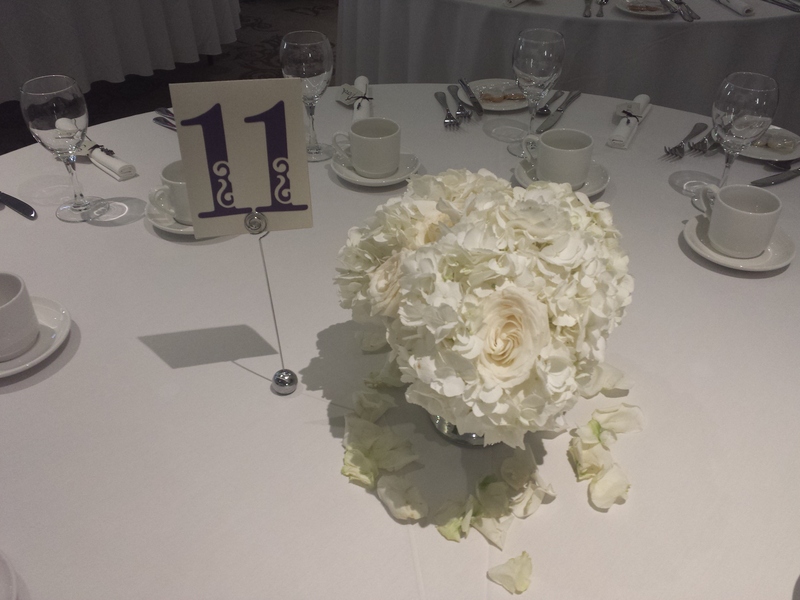 We were so happy to have the opportunity to do some of the things we do not normally offer; the altar table, place cards and seating chart. Congrats to the couple and we wish them all the best for their marriage and future! 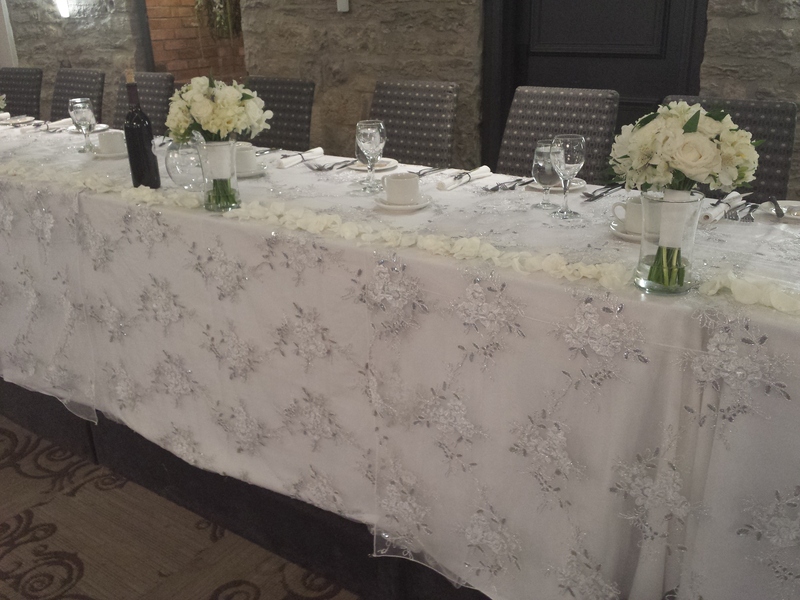 White and Silver Lace Sparkle Head Table and Fresh Flowers to start of the wedding season and the spring! 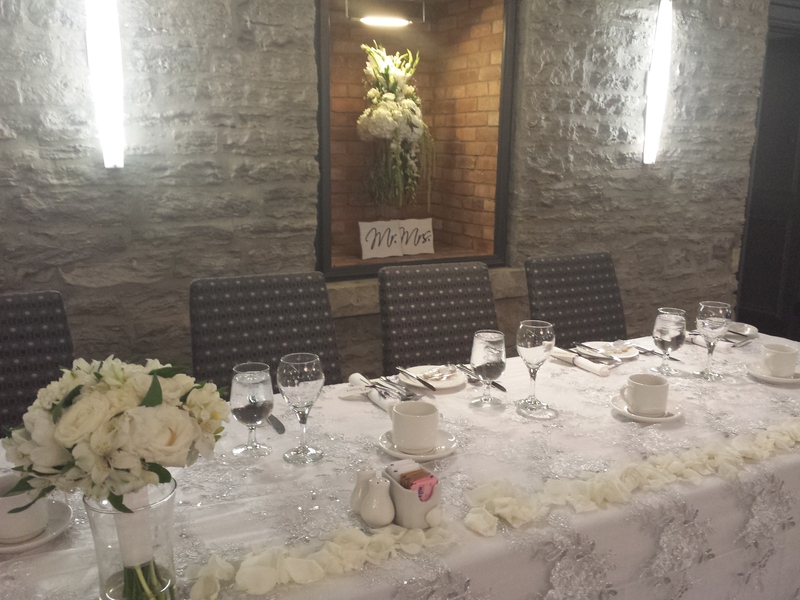 This wedding took place and the Stone Mill Ballroom in St. Catharines and it was an afternoon wedding reception. 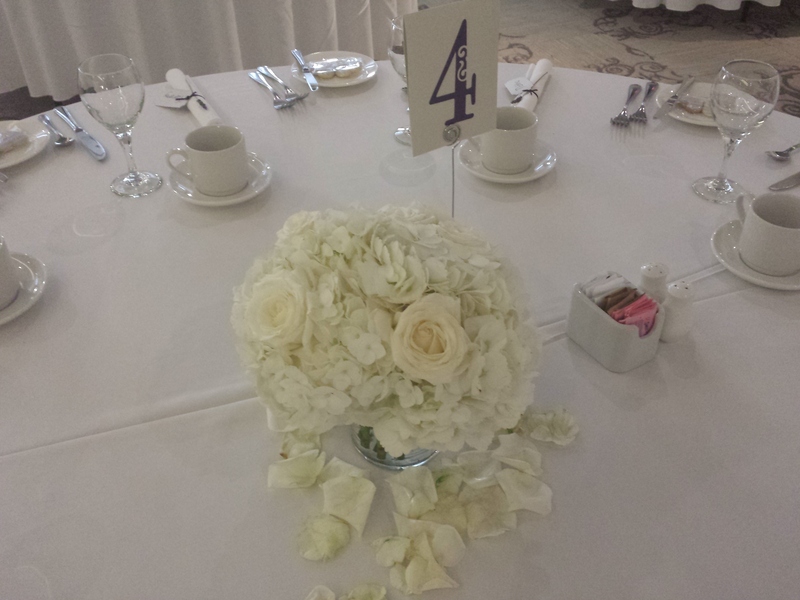 We provided fresh flower centerpieces, 3 stems of premium white hydrangeas, 6 stems of white roses with scattered rose petals around, no candlelight for during the day. 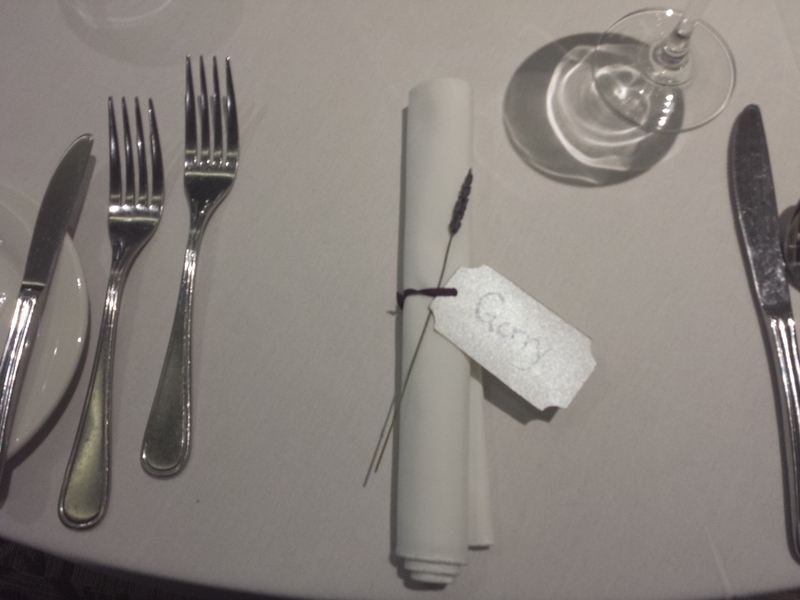 A little details that brought in the brides lavender and purple, was a dried sprig of lavender at each place setting, nicely tucked into the tied napkin with the guest’s name. 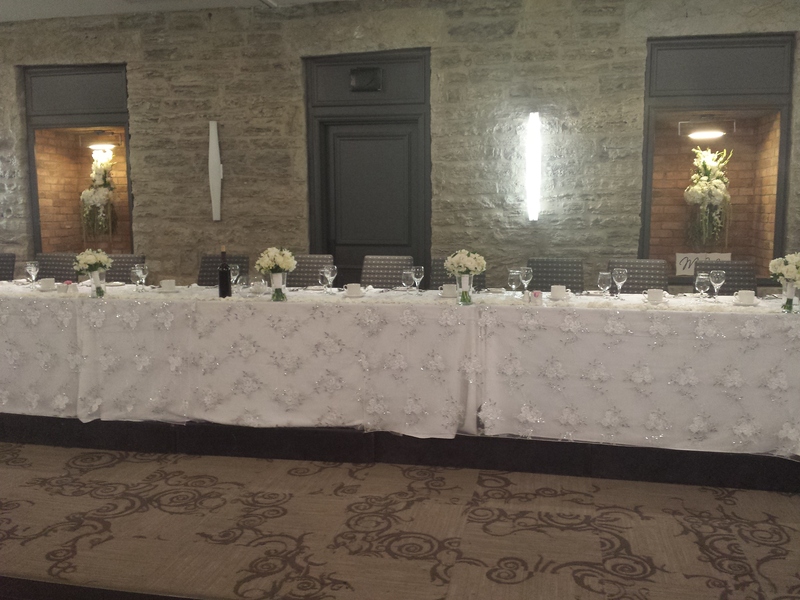 The Stone Mill has large pockets right behind the head table, very large. We created fresh flower arrangements for these pockets, they were about 1 meter in size, but filled the pockets perfectly. 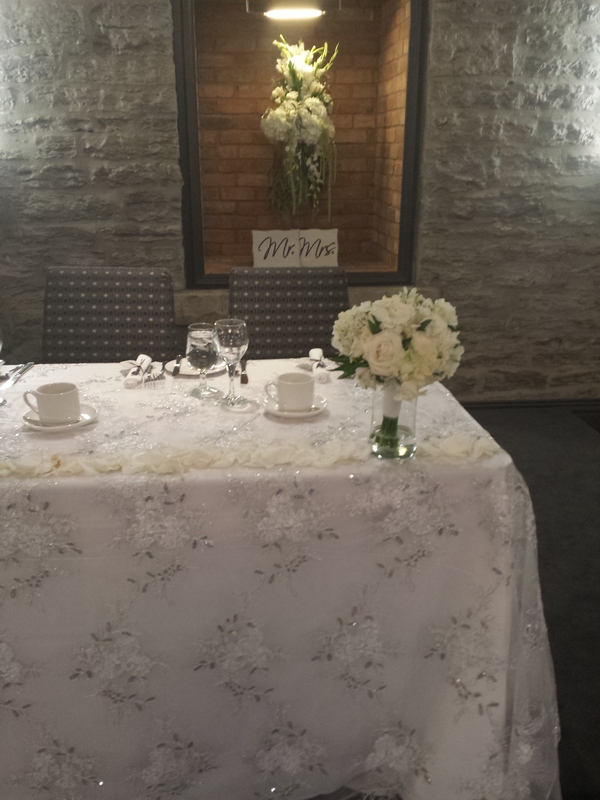 The head table was our newest head table option, with a fancy lace overlay, this one was white and silver over a white table cloth. This option is very fancy and a great alternative if you do not like full draping. The brides and bridesmaids then placed their bouquets on the head table to complete the look. The bouquets consisted of; roses, bouvardia, dendrobium orchids, freesia, alstro, tulips and mini calla lilies all in white with a bit of dried lavender. It was very delicate and was made to match the brides dress perfectly and her delicate theme. Congrats to this fabulous bride a groom, we wish theme a wonderful journey in life!